Once again, France has today been the scene of enormous demonstrations with thousands of motorcyclists gathering in every city across the nation and protesting at the newly proposed speed limit of 80 km per hour on the national road network. 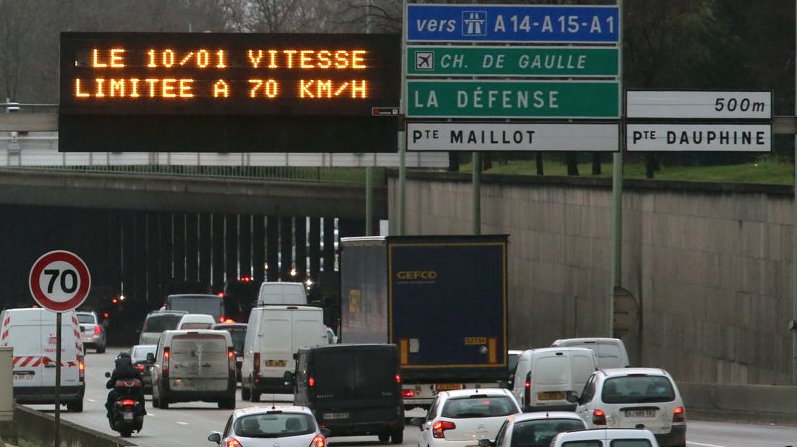 The French government has recently proposed to limit the speed to 80 km per hour on the non-motorway network in an attempt to reduce the number of accidents and casualties on the roads. A large number of bikers fundamentally disagree with the proposal stating that speed is not the main cause of accidents but rather the complete lack of adequate training offered by the government to make drivers realise that driving safely is all about respecting the highway code and learning how to share the roads with other users. The angry bikers accuse the government of wanting to impose draconian measures in the sole attempt to cash in extra euros from road users who simply won’t respect the proposed speed limits. Paris alone saw more than 5,000 angry bikers blocking the city centre for hours and bringing it to a complete standstill. “We will never accept to be treated like cash cows by our government just because we refuse to follow stupid rules. We demand better training, improved road infrastructure, access to bus lanes, to name a few. Simply reducing speed limits does not help drivers improve their driving habits and learn how to share the roads with motorcyclists”, says Damien, a frustrated motorbiker we interviewed this afternoon during the Paris protest. The French capital was brought to a complete stop during a busy shopping afternoon and thousands of angry bikers also gathered outside the head council offices to remind the newly elected mayor, Anne Hidalgo, that she’d better keep her promise to maintain motorcycle parking free of charge in Paris if she doesn’t want to have to cope with regular and highly disruptive bikers’ demonstrations. 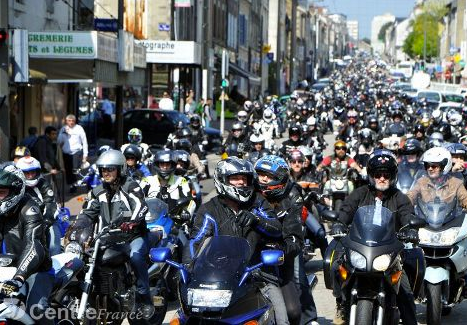 Other cities across France also saw massive protests today with thousands of angry motorcyclists showing their opposition to the reduced speed limit. 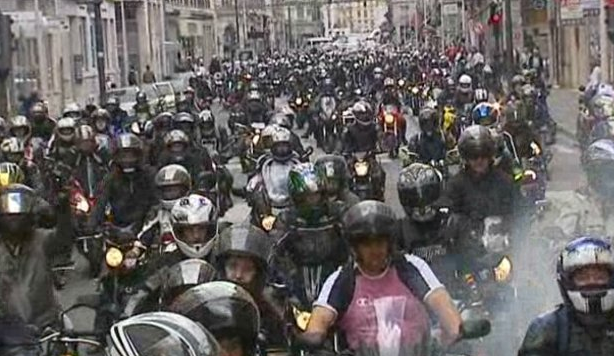 Lyon, the second largest French city, was also paralysed this afternoon with thousands of bikers blocking the city centre and protesting at the new speed restrictions. A number of key roads and junctions had to close in the heart of Lyon as they were taken over by the angry bikers. 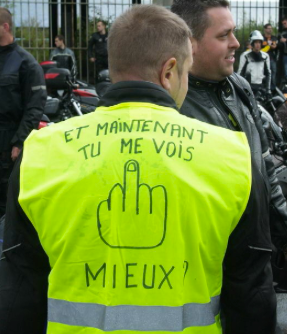 Protests took place in 80 towns and cities across the country and were all organised by regional branches of the extremely respected and powerful Fédération Française des Motards en Colère (FFMC) also known in English as the French Federation of Angry Bikers. A number of fellow bikers in the United Kingdom have been following the actions undertaken by their French cousins with deep interest. “We very much admire our French colleagues for their determination to fight every piece of anti-bike legislation. Unfortunately, in the U.K. bikers tend to accept government spin and don’t have the courage to say no to stupid laws like the French do. We don’t have such a powerful body like the FFMC and I wish we had one. Vive la France!”, said Graham, a London based biker. The French government will further discuss the proposals in May and a decision will be made by the end of the year. 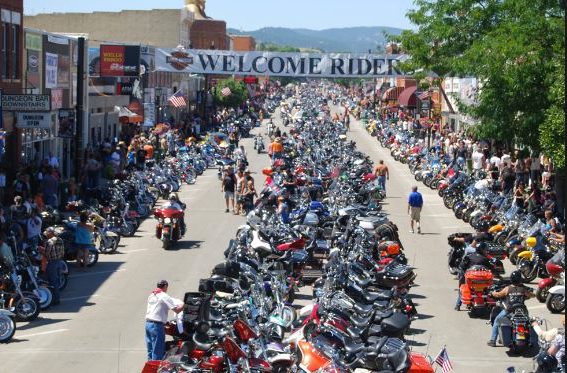 The bikers are prepared to take up the streets again if need be to express their on-going anger. 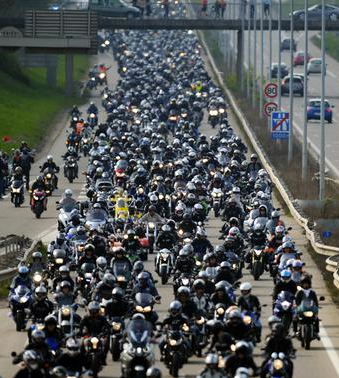 Thousands of motorcyclists protest at the lack of parking spaces in central Paris. With more than 150,000 motorcyclists riding across the heart of the French capital every day, bikers expect the local authorities to provide sufficient and adequate parking facilities to meet the ever increasing demand. Unfortunately, there is a serious lack of motorcycle parking bays and spaces in Paris meaning that more and more bikers have no alternative other than park on pavements, especially during rush hour on a busy working day. Unless you leave home early enough in the morning to find a space within walking distance to your final destination, you either find yourself riding around for a good 20 minutes to finally find a space or park on the pavement hoping that you won’t get a nasty ticket even if your bike doesn’t obstruct the pedestrian path. Some time ago, we published a post in which we explained that 2,500 on street car parking spaces in Paris were being converted into free motorcycle spaces to meet increased demand. We also compared this wonderful initiative with that of the central London council of Westminster who decided to charge for motorcycle parking in an attempt to decrease demand for a mode of transport that reduces congestion and pollution and also offers an affordable transport solution for those in financial difficulties. Today, whilst Westminster Council continues to charge bikers for parking, resulting in many parking bays being constantly empty or severely under utilised, the number of bikers in Paris keep rising and no more parking spaces/facilities are being offered to them. Unlike London, Paris does not operate a congestion charge (and has no intention of doing so), so the city is extremely congested and one would hope that the local authorities would encourage the use of motorcycles to reduce congestion by providing enough parking spaces for all. 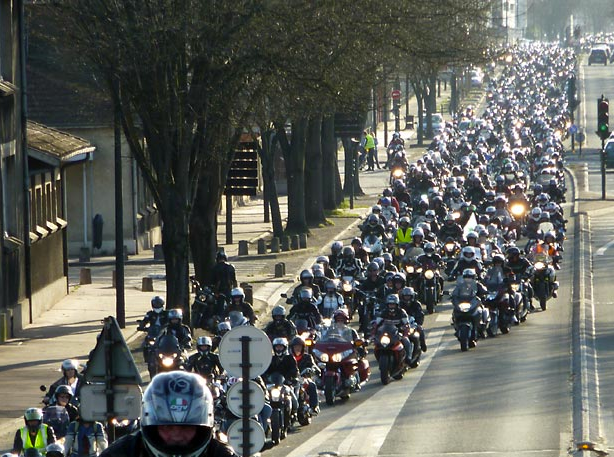 Thousands of bikers gathered in central Paris last Saturday (1st February 2014) to protest at the lack of parking spaces and demanded a thorough review of the existing parking arrangements for motorcycles. The demonstration was organised by the most respected and powerful “Fédération Française des Motards en Colère” (The French Federation of Angry Bikers) – also known as FFMC – just one month ahead of the mayor elections to make all candidates realise that they must consider motorcycle parking as a top priority in their agenda or else face the consequences and inconvenience of repetitive demonstrations that could cause traffic chaos in the French capital. “We want more parking spaces and will carry on protesting until we obtain what we want. Motorcycling should be encouraged rather than restrained, as our mode of transport is the solution to congestion problems in large cities such as Paris. The FFMC has made proposals to the local authorities on how to increase the number of parking spaces by maximising space utilisation and using areas on the pavement that do not obstruct pedestrians in any way. All they have to do is listen to us and we will stop our protests”, said Pierre, an angry biker who commutes from outside Paris on his 1,200cc motorbike every day. We now leave you with a few videos of the protest that will give you an idea of its magnitude. This is one of many protests to come if the local authorities continue to behave like “we can’t see you, we can’t hear you”. It is now official: the speed limit on the Paris “périphérique” (the ring road that encircles the French capital) has been reduced to 70km/hour from 80km/hour (that is 44 miles/hour from 50 miles/hour) and all the signs have now been replaced with new ones (at a total cost of 22,500 euros) to enforce the new speed limit. The “périphérique” has seen its first speed limit reduction in 40 years as the maximum authorised speed had been capped to 80km/hour for all this time. The official reasoning behind the change doesn’t make sense. The authorities claim that the speed limit reduction will generate less noise, pollution and fewer accidents on a road that is used by 1.3 million motorists daily. The reality is that the “périphérique” can literally be a car park, where thousands upon thousands of motorists get stuck in endless traffic jams throughout the day. The average speed during the day on the “périphérique” is 37 km/hour, so where is the logic behind the new speed limit? There will hardly be any reduction in the number of accidents during the day and the noise and pollution will remain the same. This is just another piece of spin from the authorities to make Parisians blindly accept the new rule. The only viable way to significantly reduce noise and pollution is to encourage people to get rid of their car in one way or another or, at least, switch to a more recent and less polluting car. It is highly unlikely that many motorists will be caught speeding during the day because of the massive traffic jams, however, overnight this might be a complete different story. The “périphérique” is obviously massively less busy overnight and this is when the 14 speed cameras that have been installed all around the ring road will generate a small fortune for the local authorities. For motorcyclists, the situation may well be different and, in fact, extremely frustrating. 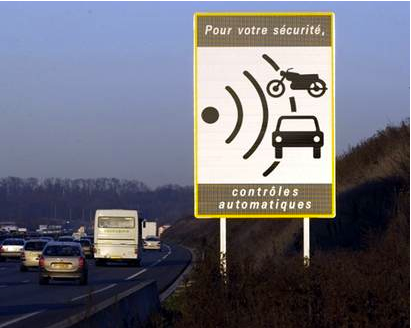 It is still illegal to filter (lane split) through stationary or low speed traffic in France, so in addition to ensuring that bikers don’t ride over the new 70km/hour speed limit at any time, they are expected to remain stuck in traffic, like cars do! If you’re a biker in the United Kingdom, where filtering through stationary (or low speed) traffic is perfectly legal, imagine yourself forced to remain stationary in between cars although there is plenty of space ahead and aside for you to ride through. Anyway, all this has generated a cost for the local council of 22,500 euros (18,750 pounds sterling) to get all the signs changed and the old ones disposed of. Is it really worth it? There’s little which most motorcyclists enjoy more than getting on board their machines and heading off to meet other bikers. In terms of their love for their ‘wheels’, there is unlikely to be any other group of road users who make use of their transport so regularly to meet up with others who share their passion. But then again, apart from trucking – whose fraternity also counts a surprising number of bike fans – no other types of wheels brings with them a sense of belonging to a distinct group of road users like a motorbike. So for the uninitiated, here is a list of some of the biggest biker events which take place regularly around the UK. Space prevents the inclusion of the many other rallies and ride-outs organised by the multitude of private clubs in all parts of England, Scotland, Northern Ireland and Wales, but most clubs have a website these days on which such details can be found. The TT is more than just a race around nearly 38 miles of roads on this island in the Irish Sea – it’s a biking institution. The event has grown from a simple race to a two-week celebration of biking skills and daring, comprising a series of organised races, along with the chance for bikers of all ages and abilities to ride the course, along public roads, themselves. Those showpiece races, though, involve riders hitting speeds of up to 180mph on some of the long, fast straights, and then putting their bikes through tremendous strains as they slow down for the twistier bits. The TT Classic, as the name implies, is a similar event, which sees riders of the classic racing bikes of years gone by compete around the course. This is held over the August bank holiday weekend. If you have a need for speed, then the British Superbikes Championship is one of the best ways to satisfy it. Twelve race rounds take place each year between early April and late October, around such famous racing circuits as Brands Hatch, Silverstone, Donington Park and Oulton Park. The bikes being raced are close to standard production models – albeit at the top end of the range, with 1,000cc engines, producing up to 200 brake horsepower. Private teams can enter alongside the so-called works teams, which have the full backing of resources and technical know-how from top bike manufactures such as Honda, Ducati, Yamaha and Suzuki. Again, events are stretched out over a three-day weekend, which culminates in two races on the last one, and there are support races designed to encourage younger riders and private competitors, making this the nearest equivalent the sport has to Formula 1. While this mid-July annual event focuses on the greatest cars ever to compete on the track, bikes are getting more of a look-in. It’s all about being able to get close to the bikes, and the riders who made them famous, with the organisers pulling out the stops to get as many of both gathered. A ticket-only event, it’s always sold out well ahead of the three days themselves. These are the biking world’s equivalent of the Motor Show, where the latest hardwear and all other associated products are shown off by the trade. Large programmes of live entertainment have also grown up around them, featuring music and celebrity PAs, and there are loads of stalls to tempt attendees to part with their cash and find out more about anything to do with bikes. A custom bike show, but on a massive scale, this also features stunt bike shows, as well as modern and classic modified bikes and demonstrations of the bike-builder’s art. There’s also an associated event organised by the Motorcycle Action Group, which features camping, a bar and evening entertainment. However, Xtreme and the so-called MAG Bash are separate events, so tickets must be bought individually. This is a guest post written by Jonathon Butterworth, who is a freelance blogger currently writing in conjunction with Sorrymate the biking specialists. We published a post a couple of months ago where we explained that France and Spain had agreed to exchange vehicle registration data, as it is now more and more the case between member states of the European Union. 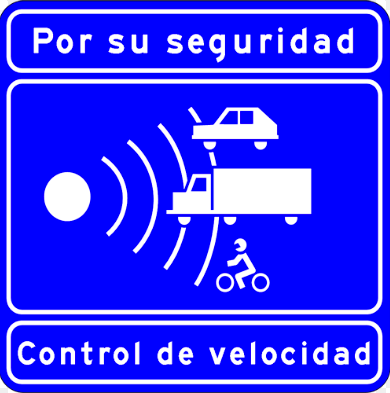 This means that car drivers and motorcycle riders caught speeding, going through red traffic lights, driving/riding under excess of alcohol or more generally breaching the highway code of the EU member state they are visiting, will eventually find a nasty and expensive fine at their doorstep in their country of origin. The French authorities have successfully continued to secure vehicle registration data exchange agreements with other European countries. France and the Netherlands have recently signed such agreements, which means that any biker/car driver registered in France or Holland and found breaching the local road regulations in the other country will be sent (recorded delivery) a nasty fine at home on their return. This may be confusing for a number of road users because speed and alcohol consumption limits are still not totally harmonised across the European Union, which means that each member state may impose its own regulations, within reason. Drivers/riders registered in France are therefore strongly advised to familiarise themselves with the road regulations of the European country they wish to visit to avoid receiving a ticket at home. Three member states of the European Union have (so far) refused to enter into vehicle data exchange agreements. These are Denmark, the Republic of Ireland and the United Kingdom, so UK bikers/drivers do not face the risk of receiving a fine at home should they mis-behave on the European continent. However, UK bikers/drivers still face the risk of having to pay a fine on the spot if caught by a cop on a continental road. We have yet to see what happens if a driver/biker refuses to pay the fine once back home, as it is our understanding that the recovery of the monies due are under the full and sole responsibility of the country which issued the fine in the first place. So if a French biker caught mis-behaving on the road whilst visiting the Netherlands decides to ignore the fine once back home, we have yet to see whether the Dutch authorities would turn up at the biker’s doorstep in France to demand payment. The same principle applies to any other EU country with which France has signed vehicle data exchange agreements. If you have experienced the receipt of a fine from another EU country as a result of breaching the local highway code in any way, please do not hesitate to leave a comment and share your experience with us and other readers. As of 1st August 2013, all drivers or riders of vehicles registered in France who get caught either going through a red traffic light or speeding in Spain will see a fine posted to their home address in France by the Spanish authorities. The same rule applies to Spanish registered drivers or riders whilst in France, who will also receive a fine from the French authorities at their home address in Spain. The two countries have agreed to exchange vehicle registration data, as it is more and more the case between member states of the European Union. The current heatwave is a perfect occasion to visit Spain by motorbike, but if your motorbike is registered in France, you are strongly advised to keep an eye on your speed at all times. You may be caught by a hidden automatic speed camera and find an unexpected fine on your doorstep on your return from holiday. This has got nothing to do with nationality. UK nationals resident in France who ride a motorcycle registered in France and spend some time touring Spain must be aware of this new rule. We are not aware of the existence of a similar agreement between the UK and France or Spain as yet. According to Le Parisien, 450,000 drivers/riders registered in Spain got caught by French automatic speed cameras in 2012 and 130,000 drivers/riders registered in France got caught in Spain in the same year and walked away without paying any fine. The split between cars and bikes is unknown but, nevertheless, the rule applies to all registered vehicles regardless of how many wheels they may have. A similar agreement already exists between France, Belgium, Luxembourg and Switzerland, although the latter is not a member of the European Union. France: high visibility vests compulsory again? And now can you see me better? Unfortunately, the debate over the potential mandatory high visibility vest for all riders has just resurrected with the government now considering the option of forcing all bikers to carry one with them at all times, but without making it compulsory to wear whilst riding. Does that make sense? Well, not really to be honest! This is another ridiculous and ludicrous anti-bike piece of legislation designed to catch as many bikers as possible and fine them on the spot for not following the law. So let’s discuss any logic behind this new proposal. Remember, this is only a proposal at this stage, you do not need to carry or wear a high visibility jacket in France until further notice. The government’s idea is to force bikers to wear the vest only when they breakdown alongside the road and/or need to park the bike on the side in case of an emergency or accident. So if you get caught while riding without having a high visibility jacket with you (either in your bike or your bag), you will not be fined as you are not expected to wear it while using your bike. However, if you get caught not wearing the vest in the event of a breakdown, flat tyre, emergency stop or accident, you risk a fine of 35 euros payable on the spot and possibly a couple of points taken off your licence. This would also apply to foreign bikers visiting France. I can only smile when I come across stupid proposals like this, especially from a highly unpopular government at this present time. Let’s see what the FFMC has to say about this and how long it will take them to get these French bureaucrats to scrap their proposals.